Our first fundraising effort in 2007 was the Camp Smile A Mile Ride of Love (http://www.rideoflove.org). It is a 152 mile bicycle ride from Tuscaloosa to Lake Martin, the site of Camp Smile A Mile. Jim completed the ride this year with a total of 122 miles and raised $1767.00 for Camp Smile A Mile. In all the group had 73 cyclists and raised in excess of $112,000.00 for Camp Sam!!! 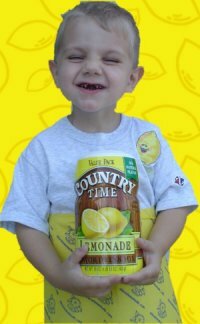 Our second fundraising effort of 2007 was a Lemondade Stand we did for Camp Smile A Mile and the 2007 Motorcycle Ride on June 16, 2007. We were able to donate another $375.00 to Camp Smile A Mile! Thank you to all the riders who bought some Lemonade!!! We have many more exciting things planned for 2007 so we can bring awarness to Childhood cancer and raise money for this important cause. Jim also plans to ride in two other cycling events this year, the TriStates 100 and the Tour De Beach 150 Mile ride. If you would like to sponser Jim, you can make a donation of your choice now via paypal by clicking below. We are currently in the planning stages for Taylor's 2007 Lemonade Stand! We have some exciting ideas for next years stand and hope to post those ideas soon, as well as some news on how to show your support for our fight with Neuroblastoma. This year we hope to raise money for our local causes here in Alabama. Our local causes here in Alabama will be Camp Sam and Children's Hospital 4-Tower. Taylor held a Lemonade stand his year in conjunction with the Camp Smile-A-Mile Motorcycle Ride. We are still in the fundraising mode and will present Camp Sam with a check in December with our fund raising efforts this year. In May, Taylor was also able to present Camp Smile-A-Mile a check from Xi Beta Xi for $600.00 to purchase digital cameras for the campers to use at camp! 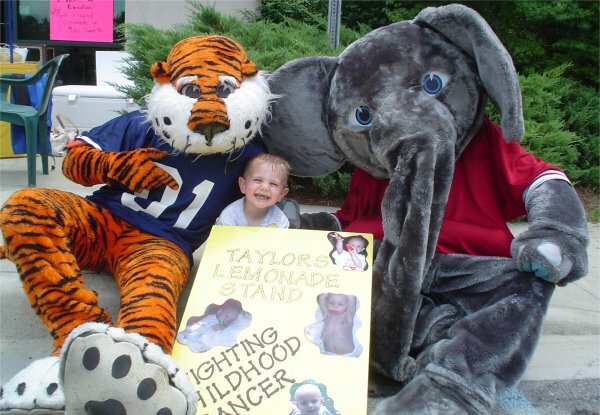 Taylor held several events throughout 2005 to raise awareness for pediatric cancer and raise money for Camp Smile-A-Mile and various other charities. Taylor's Lemonade Stand was able to donate $200.00 to Alex's National Lemonade Stand, $400.00 to Camp Smile-A-Mile, $20.00 to the Neuroblastoma Cancer Foundation and $25.00 to the Susan G Komen Breast Cancer Foundation. As soon as we locate the pictures, we will post them! Taylor held his Lemonade Stand on June 12th in conjunction with Alex's National Lemonade Stand. We raised a total in cash of $588.00. Combined with money we raised from other functions, we were able to donate $750.00 to Camp Sam and $250.00 to Magic Moments. We also sent $300.00 to Alex's Lemonade Stand to go with the national effort. In addition to the cash we raised, we were also able to sell 7 car tags ($350.00). Total raised from the stand was $938.00. With the lessons we learned from this stand, we hope to do even better next year! We have many new ideas that we plan to use to hopefully make a better impact. We hope that the money we did raise this year will go toward finding a cure for childhood cancer.